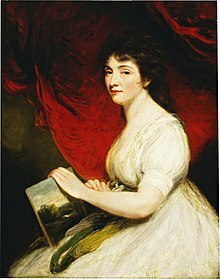 Mary Linwood and "Needle Painting"
The daughter of a failed wine merchant who died young, Mary Linwood was an independent woman who became famous for her needlework, invited to court by the royal family and exhibiting her work publicly throughout Europe. Mary Linwood was born in Birmingham, but in 1764, after Matthew Linwood's bankruptcy. he moved in family to Leicester. After his early death, Hannah Linwood Turner opened a boarding school at The Priory, Belgrave Gate (Leicester), which she ran successfully until her death in 1804, after which Mary Linwood took over the school--which she ran for more than fifty years. In the mean time, she began to practice the art of needle-painting that would bring her international acclaim. Her earliest work is said to have been completed when she was thirteen. Two more works were completed by time she was twenty. Her medium, "needle-painting," uses crewel embroidery--needle and thread--to "paint," stitches in silk wool reproducing brush strokes. In Linwood's case, she reproduced the work of old masters with her needle-painting. At about the age of twenty, she seems also to have moved to London and begun exhibiting her work at The Pantheon in Oxford Street. In 1776 and 1768, her needle-paintings were included in exhibitions of the Society of Artists. In 1785 (or 1787, sources vary), when she was thirty-one years old, she had attracted the attention of George III, who invited her to Windsor to show her work, and she was praised by Queen Charlotte for the quality of her work. The queen also visited Linwood's later exhibitions in Hanover Square. [Linwood's] fame spread and the Empress Catherine of Russia in 1783 was pleased to accept an example of her work, the King of Poland was amongst her most fervent admirers. In 1808 Talleyrand introduced her to Napoleon, whose portrait she embroidered twice. He wanted her to take her exhibition to Paris, but was prevented by the outbreak of war between the two countries. She received the Freedom of Paris from him in 1825 for her portrait of him. As for the effect of her needle-painting, one observer noted that it is "unique and exquisite. . . . [I]t is absolutely impossible for the eye to detect the fact that it is gazing upon the production of the needle, and not of the pencil." 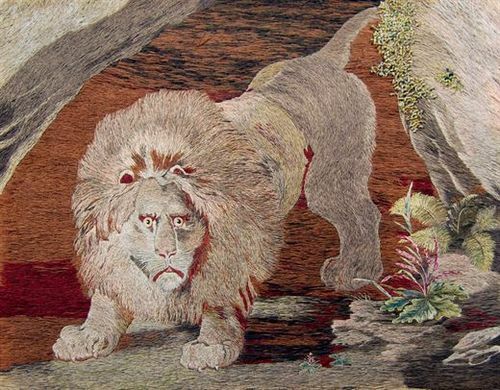 Linwood continued needle-painting until she was seventy-eight years old (although she worked as a schoolmistress until the year before her death at age ninety). Her entire collection consisted of some one hundred works, copies of works by artists such as Raphael, Rubens, and Gainsborough. While she is most famous for her needlework copies of oil paintings, her largest work is an original, The Judgment upon Cain, which took her ten years to complete. Perhaps the most famous of her works is a copy of Carlo Dolci’s seventeenth-century Salvator Mundi At one point she was offered 3000 guineas for this needle-painting, but she refused to sell it, leaving it in her will to to Queen Victoria. Linwood's collection continued to be shown in a permanent gallery, at Savile House (Leicester Square), until her death--it remained an extremely popular attraction. But interest in her work did not last, and the collection that Linwood hoped to maintain was not kept together. After Linwood's death, as Andrews writes, the collection "was offered to the British Museum," but it was not accepted because the BM "could not accommodate it." 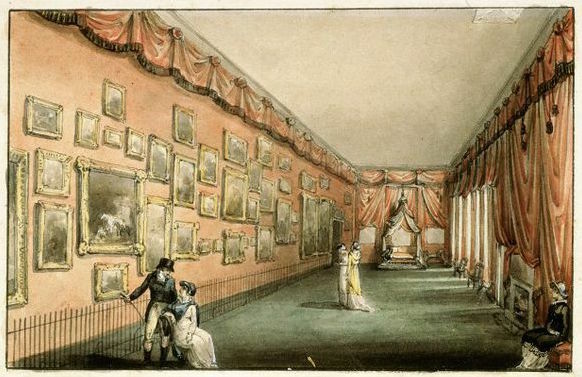 Instead, most of the collection was auctioned by Christie's on 23 April 1846. Although she had been offered three thousand pounds for her copy of the Dolci painting, the auction by Christie's of the "whole collection fetched a disappointing £300." Included in the Christie's sale was Linwood's The Judgment of Cain--the piece that had been completed when she was seventy-five, after ten years' of work. It sold for a mere £64 1s. The Bowes Museum (County Durham) has three works by Mary Linwood, including a needle-painting self-portrait. The Tate Gallery (London) included a work by Linwood in a 2014 exhibition on British Folk Art. Linwood's 1825 needle-painting portrait of Napoleon is part of the collection at the Victoria & Albert Museum.